The Villages Golf and Country Club in San Jose CA is a gated private adult, senior retirement community, exclusively for adults age 55 and over. 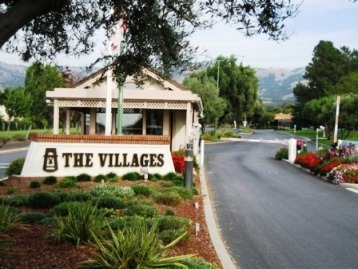 Established in 1967, The Villages in San Jose offers a safe and serene living environment and spectacular championship golf course surrounded by distinctive neighborhoods, located in the Evergreen foothills area of the Santa Clara County, California. Resort-like facilities include an onsite clubhouse & bar with party and meeting rooms. Historically an area of vineyards and estates, The Villages remains a haven of natural beauty. Some of the many recreational amenities include - 2 golf courses, community swimming pools, spa/hot tub, barbecue and picnic areas, tennis courts, walking paths and trails throughout with lake, creek, mountain and city views. Though secluded, The Villages Country Club and Golf Course is near shopping, transportation, and California's South Bay's thriving cultural community. There are 2,309 condominiums and townhomes and 227 single-family homes with approximately 4,300 residents. The Villages in San Jose has been rated among the top 20 adult communities (for persons aged 55 and older) in the United States by New Choices for Retirement Living Magazine. It is the most attractive senior housing and adult retirement community in northern California. Real estate of Silicon Valley and Santa Clara County. The Villages Retirement Community. A Special-plan Senior Living Adult Community. Active adult living and/or senior housing choices with golf, The Villages San Jose Real Estate Golf & Country Club in San Jose California. The Villages Golf Country Club 55+, Call to View All Models - TAKE A LOOK. Have an area expert help you Buy or Sell your home!